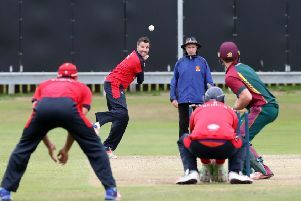 Waringstown booked their place in the Lagan Valley Steels Twenty20 Cup final with a 67 run win over CIYMS at The Lawn last night, moving them a step closer to defending the title they won 12 months ago. Batting first on a flat pitch, Waringstown got off to a flying start through James Hall and Adam Dennison, as has been the case for the majority of this season. Hall in particular was looking in fine touch, taking two sixes from Allen Coulter’s second over, bringing himself to 25* in the space of four overs, with the score on 36. After 10 overs, Waringstown were 81-0 with some quality spin bowling from James Cameron-Dow and Jacob Mulder helping slow down the opposition’s run rate. Hall notched up his half-century soon after, with his fourth six over mid-wicket bringing him to 51, including four fours and four sixes. CIYMS would get their breakthrough soon after when Hall hooked a short David Robinson ball to Jason van der Merwe on the leg side boundary when on 52, bringing Greg Thompson to the crease with the score sitting at 96-1. Waringstown reached 100 in the 12th over, perhaps slower than they would have liked, and Dennison’s innings was ended when he was caught by Ryan Hunter off the bowling of Cameron-Dow for 40. Shaheen Khan looked like he was in the kind of form that seen him get a century in the last Twenty20 match against CSNI when he scooped van der Merwe for six, but two balls later was caught for 21. Thompson is known as one of the biggest hitter’s in the NCU, and Waringstown would have been hoping he could bring them up to a total in the region of 190. That was until disaster struck and a mix-up between him and Lee Nelson seen the skipper ran out for 15 with the score on 138. It was up to James McCollum (18) to add some late runs to the total, with the home side ending their 20 overs on 169-5. CIYMS got their innings out to an even faster start with Chris Dougherty hitting three consecutive boundaries off the bowling of Phil Eaglestone. Khan would strike with his fourth ball when John Matchett skied a short ball and was dismissed for two. Captain Nigel Jones hit two consecutive fours to keep the run-rate going, but the former Ireland international chipped to mid-off with the next ball, giving Phil Eaglestone his first wicket. The Belfast side were scoring at a quick rate but kept losing wickets, with Khan striking again in the next over when Dougherty was caught on the leg side boundary by McCollum for 21. Spin was introduced to the attack in the form of Lee Nelson, and he struck first ball as Thompson took a fantastic low catch in the covers to dismiss Matt McGillivray for two. Ryan Hunter was batting well, striking a couple of nice boundaries, but he was struggling to find a partner to stay in the middle alongside him, and that trend continued when Jason van der Merwe chipped McCollum to Khan on the long-off boundary for two, leaving CIYMS 58-5 after seven overs. When Hunter was caught by Hall off the bowling of the returning Kyle McCallan for 30, all hopes of a CIYMS victory were extinguished. They were bowled out for 102 in the 17th over when McCollum collected his third wicket of the match. After such a bright start, CIYMS will be incredibly disappointed with the way their innings petered out as they couldn’t form any sort of meaningful partnership. 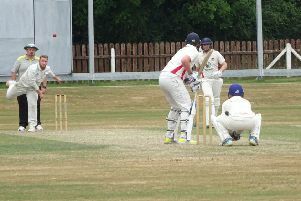 There will be a repeat of last year’s final after North Down beat CSNI by 51 runs in the other semi-final at The Green.